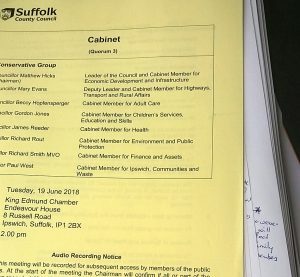 On Tuesday, Suffolk County Council’s Conservative Cabinet passed an undemocratic proposal limiting access to free school transport. I put it like this because the media narrative is that “Councillors voted unanimously.” Er… No. While any councillor could question, only the wholly Conservative Cabinet could vote. And while the Cabinet members opened their mouths, it was not to question. They spoke in turn uncritically, to offer support. Undemocratic because – having gone to public consultation and the public having made their feelings abundantly clear – Cabinet voted on an option that was universally unpopular. It did not even consider the option supported by 90% of respondents. If the public relied on the media to inform them, they would not have been aware of what happened at the meeting. The media conscientiously reported the flavour of the many excellent tabled questions from the public. However, they totally ignored the literally hours of forensic questioning from the opposition – LibDem, Green and Labour councillors – which teased out many problems and concerns with the favoured proposal. In other words the situation was framed as ‘councillors v public’ instead of ‘Conservative Cabinet fobbing off the questions of their opposition colleagues’. You might want to query this narrative and what purpose it serves. 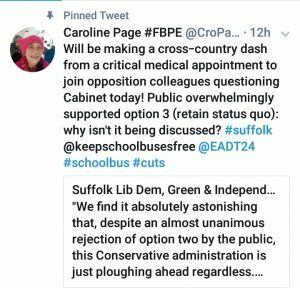 In my particular case, I travelled as fast as I could on public transport to and from an emergency surgical appointment at Addenbrookes to be there in time to hold the Cabinet to account along with my Lib Dem, Green and Labour colleagues. We all asked many questions. (I must do new Leader Matthew Hicks justice and say he chaired the meeting with justice and impartiality, allowing the opposition all the questions they wished to ask and cutting short members of his own party who merely wished to make eyewateringly inappropriate declarations of loyalty, instead of questioning Cabinet. Another issue the media could have picked up on, ‘an if it would’.). In my own questions I queried the administration’s terms of reference. Was Suffolk’s offer really “more generous” than the government minimum, when the government minimum covered urban and rural students indiscriminately? City students do not have 3 mile walks to their catchment school: city schools are closer and public transport is plentiful and cheap. We were told how expensive our spend was- over £100 a student head as opposed to Salford’s £2. However, as I pointed out, Salford has a total area of 8 sq miles. It would actually be well-nigh impossible for a child to live more than 3 miles from their local school in Salford! Suffolk, in comparison, has an area of 1466sq miles, used to grow the food and provide the electricity that places like Salford rely on. We are not comparing like with like. And, bearing in mind over 70% of respondents were women , and local government cuts disproportionally affect women, l asked whether Cabinet could be genuinely satisfied that the IA’s conclusion that “impact on women would be minimised by phasing in the changes”, fully addressed the actual impact these changes would have on women. Ominously – but unsurprisingly -this question was not answered at all.